The world is abuzz with news that gravitational waves have been detected for the first time. This is a huge leap forward for scientists’ understanding of gravity! For all that we experience gravity every day as we (mostly) stay grounded on the Earth, figuring out exactly how it works has been a challenge. Gravity draws things together, but how ? One of the most brilliant discoveries of Albert Einstein was realizing that objects with mass actually warp spacetime itself. If we imagine space as an enormous sheet, throwing a light object like a tennis ball onto it would only pull the sheet down a little, whereas a bowling ball would pull the sheet down significantly more. Everything with mass distorts the sheet though, affecting other objects on the sheet and even massless things like light as they pass through. Seeing that gravity affected light was actually the first major proof of Einstein’s theory of general relativity. During an eclipse in 1919, light from a cluster of stars was seen to distort from its normal pattern as it passed close to the temporarily obscured Sun. But another consequence of Einstein’s work was the idea that the speed of light is a maximum speed for any particle or force, including gravitation, however it’s propagated. This implies that gravitational interactions can only happen so fast, and that if a huge gravitational event were to take place emitting a lot of gravitational energy, that energy would have a maximum speed to move through the universe. What kind of huge gravitational event? Well, the strongest gravitational interactions we have been able to observe take place around black holes, whose mass causes gravitational forces that overcome even basic quantum mechanical ones that prevent matter from piling up on itself. So black holes are supermassive point objects, singularities with exceptionally strong gravity. And if two of them were to come together, their movement might create gravitational waves in spacetime itself that could be strong enough for us to detect. The Laser Interferometer Gravitational-Wave Observatory (LIGO) has been looking for gravitational waves using light as a ruler to measure whether spacetime is being warped. LIGO compares the length of two 2.5 mile long tunnels, set at right angles to each other, which would warp in alternation if a gravitational wave were to pass through them. The precision needed to see even very strong gravitational waves is tremendous, as we know from the fact that we don’t just observe our living rooms getting bigger and smaller in response to cosmic events. LIGO has been searching for gravitational waves since 1992, and improving its precision since then. Finally this week, they announced a signal! The gravitational waves detected come from two black holes merging, a billion light years from our planet. These black holes were enormous, 36 and 29 times the mass of our Sun. They merged into a black hole 62 times the mass of our Sun, converting three solar masses into energy as gravitational waves. It is these waves that the LIGO researchers managed to detect, corroborating their results at two separate facilities in Louisiana and Washington. The difference in lengths of the LIGO tunnels due to the gravitational waves was less than a millionth of the size of an atom, an astounding physical feat, and yet the LIGO collaboration is confident in its measurements to 99.9999%. Validating a prediction made over a hundred years ago about the way mass warps spacetime is impressive enough, especially considering that gravity is still the least well understood of the four fundamental forces. But it’s also a beautiful new way to look at the stars, and at the massive universe beyond our planetary doorstep. What is color, and what does it mean for an object to have a specific color? Well, color comes from the fact that light can have different sizes, the way objects reflect that light, and the way our eyes can see it. Light is made up of these tiny packets of energy, photons, which travel as waves that can move through air or space. And there’s a distance between the peaks of the waves, the same way there would be for waves in water, which is the size of the light. 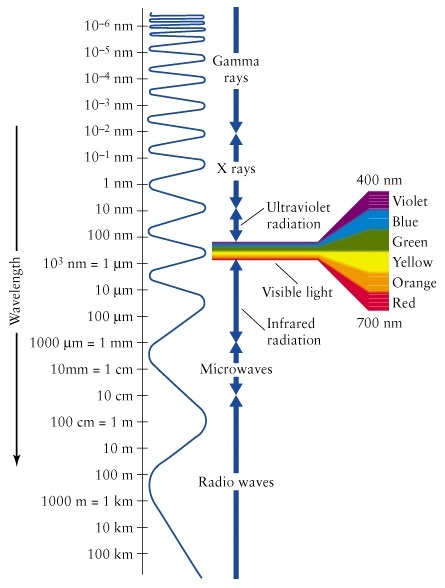 Light can have a whole range of different sizes, so the microwaves that you use to cook food or the radio waves that carry sound through the air are both different sizes of light. But there’s a special range of light, the visible range, which contains the sizes of light that our eyes can detect. So in the visible range, we have shorter lengths of light, which our eyes see as more blue, and longer lengths of light, which our eyes see as more red. In between, you have the full rainbow, which has all the colors we can see. The sun shines light on us with the whole range of sizes, but different objects will reflect different sizes or colors back at us. So an orange is absorbing most visible light but reflecting orange light, and then our eye detects that light and our brain tells us it’s orange. But we need special cells in our eyes to detect color. Most people have three kinds of color-detecting cells, called cones, that pick up blue, green, or yellow light. From these three colors, our brain puts together the rest of the rainbow, like an artist does when mixing paint. People who have fewer or more kinds of cones will perceive color differently, maybe being color-blind or seeing even more colors than average, even though the light itself is the same! If you want to know more, we have some nice posts in the archives about visible light and why the sky is blue.